It wasn’t until he moved from Manhattan to McKees Rocks that it fully struck him. McKees Rocks, Taris Vrcek realized in a sudden moment of clarity, had even more potential than he had thought. He grew up in McKees Rocks, leaving for Manhattan in 1997. When his mom died, Taris wanted to spend more time with his dad. And he wanted to carry on the tradition of his parents, who were active in the community. His dad owned a tavern and his grandparents had owned one, too–as well as a restaurant, barber shop and ice cream shop. The family roots ran deep. Goodbye, Manhattan. Hello McKees Rocks. It was a far cry from his former life, operating his own custom software design and development firm while living in Murray Hill, a part of Manhattan he loved. But he left the cosmopolitan lifestyle to return to ‘The Rocks’, a borough in Allegheny County along the south bank of the Ohio River ten minutes from Downtown Pittsburgh. Once home, he started volunteering in the community and worked his way into a paid position as the McKees Rocks Community Development Corporation (CDC) Executive Director. 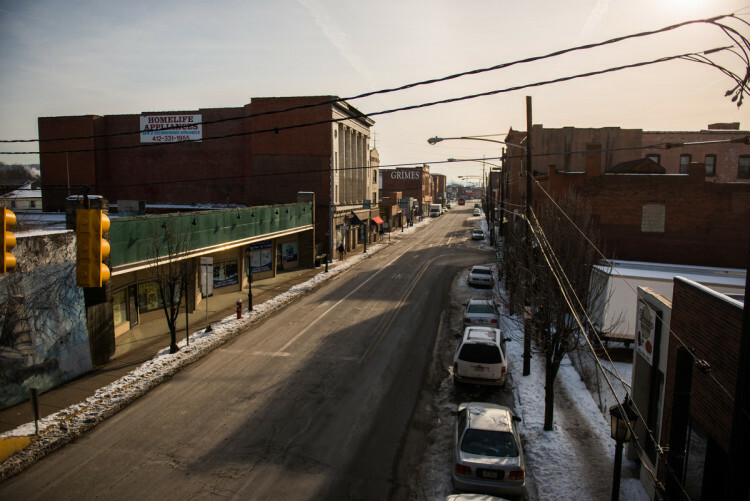 McKees Rocks is a town filled with ethnic traditions and rich history. The original Robert Wholey Co. opened its doors in 1912 and the first American Eagle Outfitters premiered there. Since then, many other businesses, including Linders, a legendary fine furniture store, have opened in the town. The neighborhood, with a population of 6100, is known for its mouth-watering pierogies as well as cinnamon bread from 5 Generation Bakers. And it continues to be a manufacturing town with companies making concrete inserts for steel mills. Now, Vrcek has a vision for his hometown as a destination for the arts and music, one with the same energy as the east end of Pittsburgh. It’s something that’s lacking on the west side of town, he says. 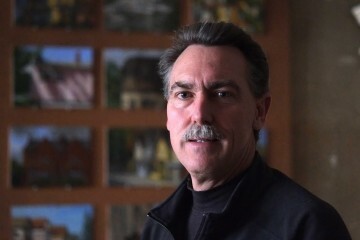 “I think we can kind of take the lead and connect the dots with places like Coraopolis and Bellevue and the West End to kind of bring some of that vitality that’s made the East End exciting,” he says. The McKees Rocks CDC’s first phase of renovation is underway at the 1928 Roxian Theatre on the main street of Chartiers Ave. Yellow caution tape and chain-link fences line the construction site at the moment, but Vrcek says they are on track to open their doors in 2017 as a performance and events center. A rendition of the future theatre sports a marquis promoting the Mumford & Sons as an upcoming act. Vrcek says the theatre, with a capacity of 1500, will fill a void in the Pittsburgh region for a live performance venue space. The first phase, the facade renovation, will recreate the original entrance and lobby. Now, the McKees Rocks CDC has to prove the project is sustainable. The idea is for a venue that generates private income first by bringing in national and local concerts and in addition, making the space available for rentals. 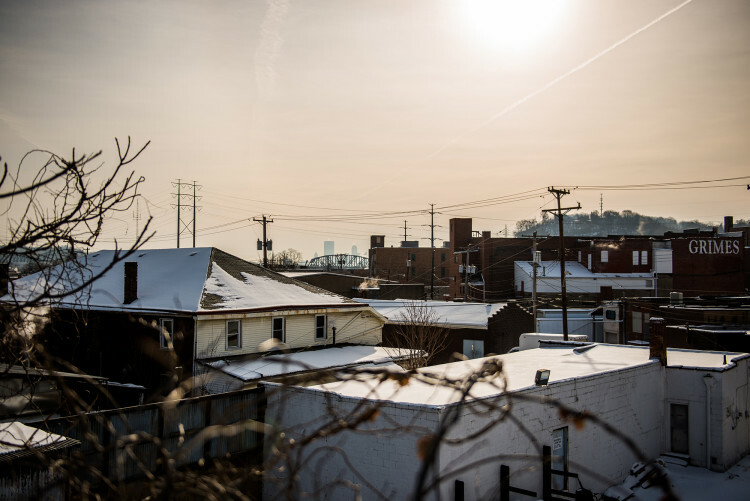 “If we can establish that with this master plan and really show our due diligence, then we have a funding community that I think sees the value of this project and what it means not only for McKees Rocks, but for the region,” Vrcek says. The Roxian is only one project in the works for redesigning the town. 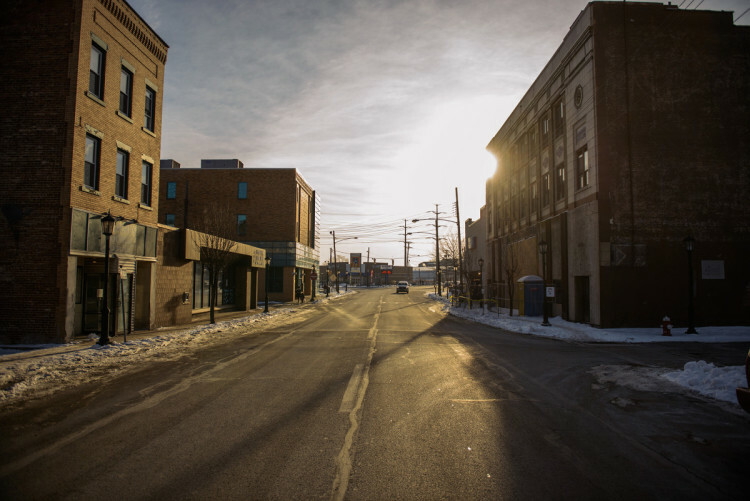 The town has some great assets, but they are under utilized, Vrcek says. Among them: public transportation access, waterfront space, green space, and noteworthy architecture. A decent home in McKees Rocks could be had for under $50,000, in some cases $20,000, compared to a home going for about $200,000 to $300,000 in Lawrenceville, he notes. In conjunction with the County, The Rocks also has a vacant property program to help home buyers acquire a home for even less. Another plus: The McKees Rocks CDC works with Focus on Renewal, a human services organization based in the Rocks, to strengthen the community in other ways. One way is to break the cycle of poverty through arts. The Father Ryan Arts Center opened its doors in 2008 as a performing and visual arts center serving McKees Rocks and beyond. The center offers all kinds of classes, from dance and music to ceramics as well as a Brightside Academy child care center on one floor. Young singer Terrance Austin, who has been taking classes at the Center since its inception, helped organized a choir and has networked with local jazz artists such as Maggie Johnson through the center’s Jazz Generations program which links jazz artists with young students. According to Vrcek, 17,000 cars drive down Chartiers Avenue daily, a street that is also known as Route 51. But the awkward traffic orientation that makes cars loop through one-way, also prevents the drivers from experiencing the downtown district. “We want traffic to stay on the front street to enjoy these fantastic buildings, to stop and do business,” Vrcek says. The McKees Rocks CDC has plans to reconfigure the avenue into two-way traffic, thanks to a multi-million dollar grant by the Allegheny Conference on Community Development through the Strengthening Communities Partnership (SCP). Someday, lower Chartiers Avenue could be pedestrian-friendly and function like a business district. 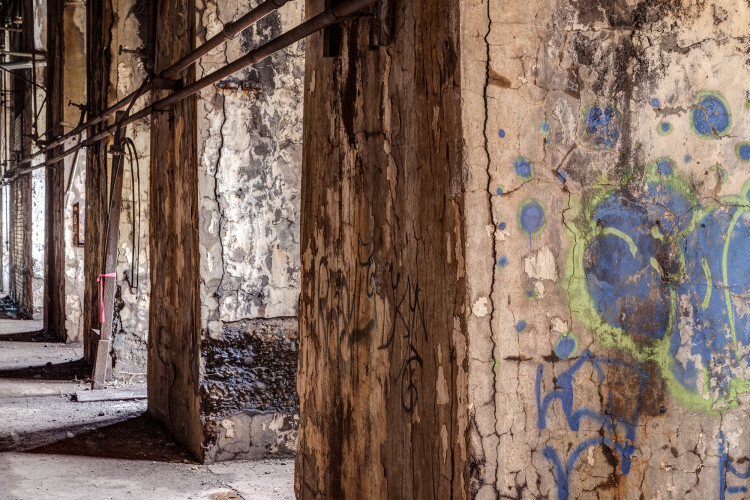 The SCP addresses disparities still present in many of our region’s communities, by accelerating neighborhood improvement through concentrated private investment in community development corporations. 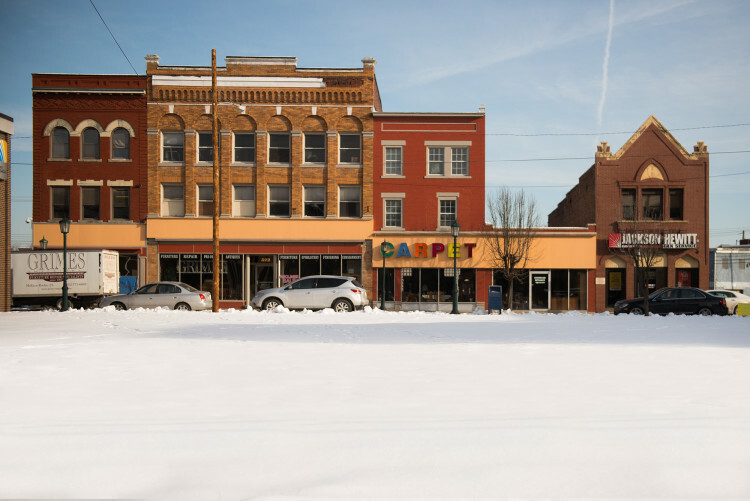 McKees Rocks was one of five CDCs chosen to receive $500,000 per year in business tax credits under the PA Department of Community and Economic Development’s Neighborhood Partnership Program (NPP). A maximum of $3 million per community will be paid over six years. Funding for the program will come from Pitt Ohio Express ($600,000); Dollar Bank ($450,000); and TriState Capital ($450,000). Duquesne Light Company, First Niagara and UPMC Health Plan are companies that are already participating in the state’s NPP in McKees Rocks. It will also help leverage the 120 acres of adjacent industrial development that’s underway, anchored by another boon project, the $50 million CSX intermodal facility.